CrystalDiffract 6 program interface showing a three-phase mixture plotted with other patterns, and with screen tools visible. The Search field in action: the 004 peak is shown and (if the Reflexions List is open) its list row is highlighted. Editing a crystal structure: note the spacegroup recognition, site occupancy control and anisotropic temperature factors. 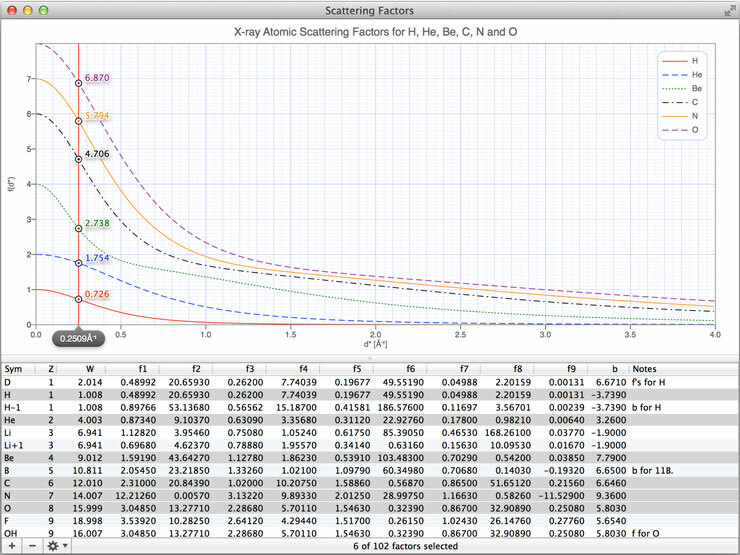 X-ray atomic scattering factors visualized for various elements, using the Scattering Factors windiow. 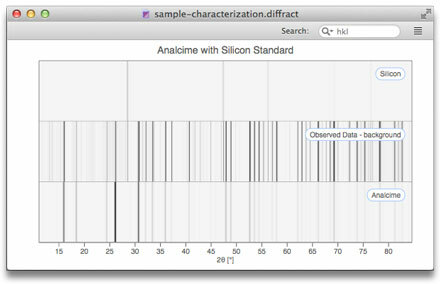 CrystalDiffract brings the world of x-ray & neutron powder diffraction to your computer screen, with interactive control and easy characterization of your experimental data. 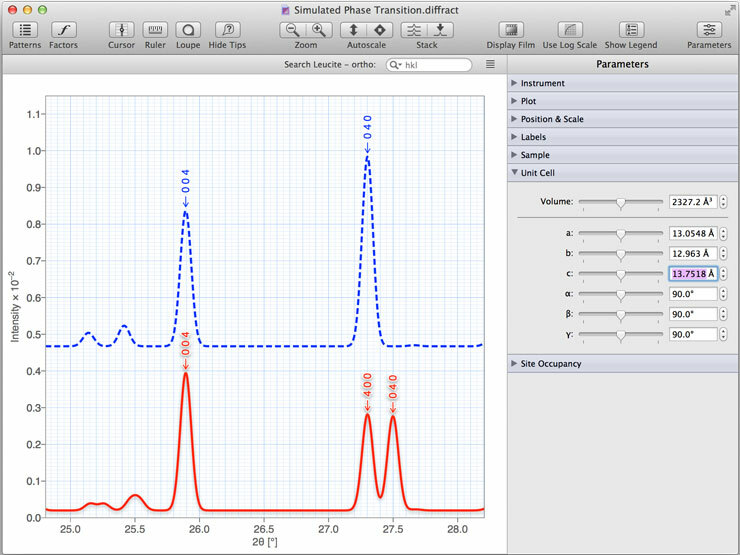 Real-time parameter controls let you experiment with diffraction and sample settings, with instant feedback. 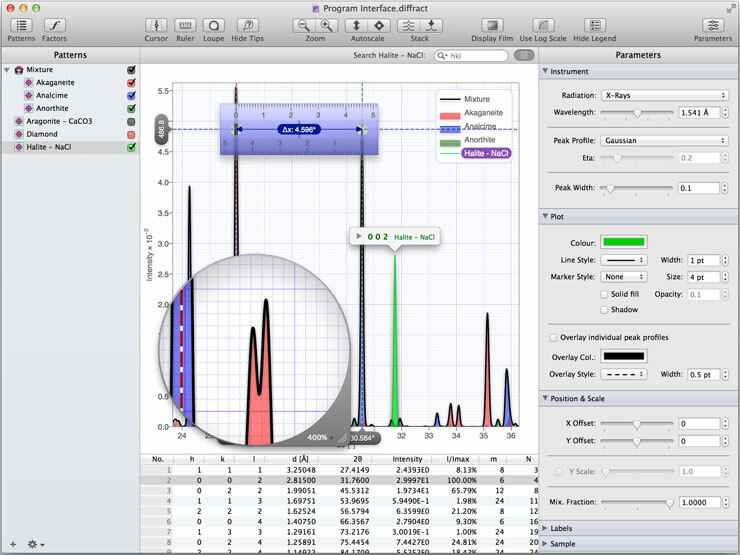 Combine these with instant mixture creation - and the ability to load observed data in the same window - and you have a powerful workbench application for researchers, teachers and students. Need single-crystal diffraction? Try our award-winning SingleCrystal. 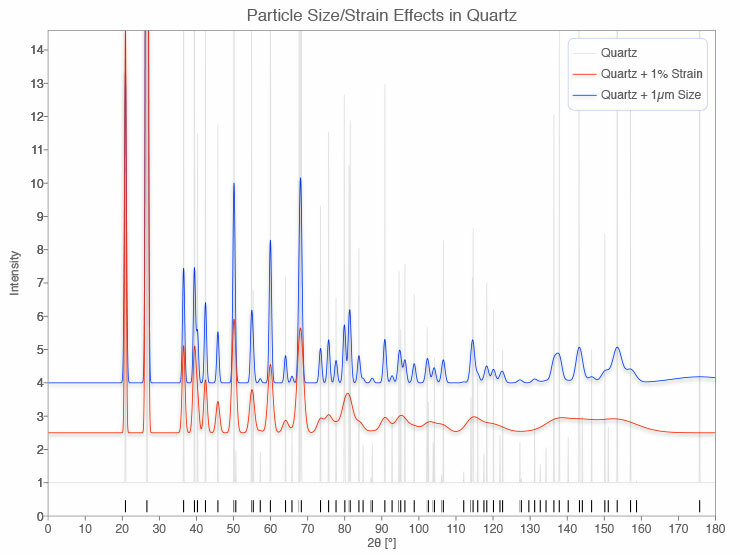 What's New in CrystalDiffract 6? CrystalDiffract provides powerful x-ray and neutron powder diffraction simulation capabilities: but is quick and easy to use. Choose one of four preset simulation types: constant-wavelength X-rays, neutrons; energy-dispersive X-rays; or time-of-flight neutrons. 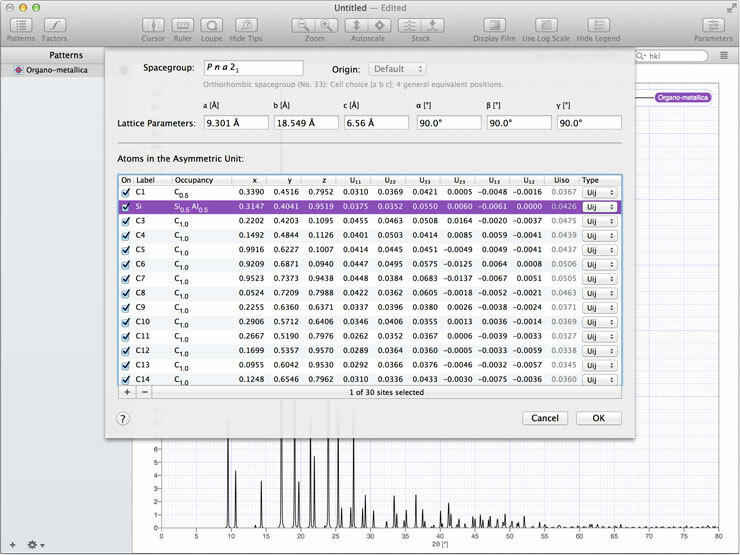 Multi-processing allows for fast profile simulation, and real-time adjustment of diffraction and sample parameters: placing you firmly in control of your diffraction experiment. 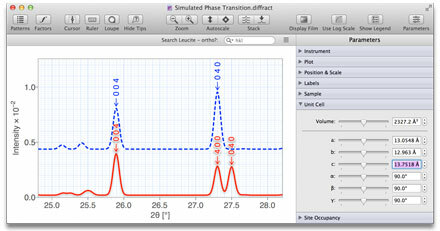 Simulating a phase transition from tetragonal (blue graph) to orthorhombic (red). 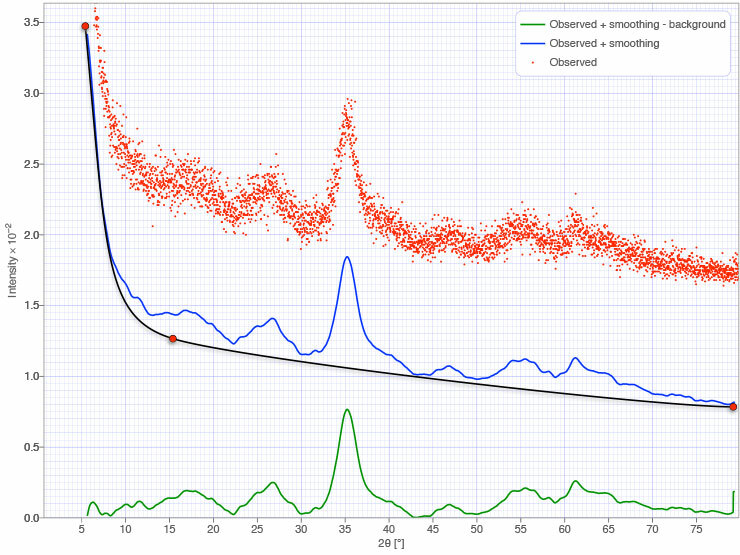 Unit cell parameters an be edited on-the-fly to see how peak splittings change. CrystalDiffract lets you import multiple experimental datasets for comparison with simulated data: just drag-and-drop text files into your diffraction window. You can manipulate and rescale your observed data, apply real-time smoothing and background corrections - and then use the innovative screen tools to measure your observed pattern. 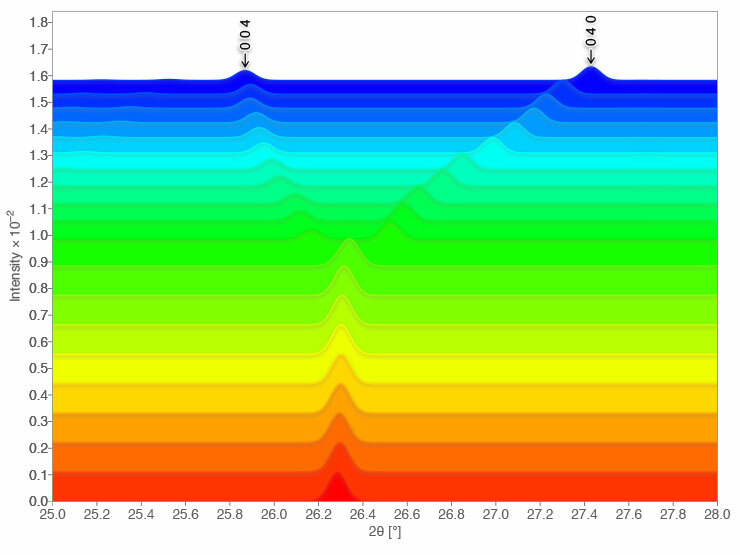 Compare with simulated patterns to check for purity - or attempt a phase identification. 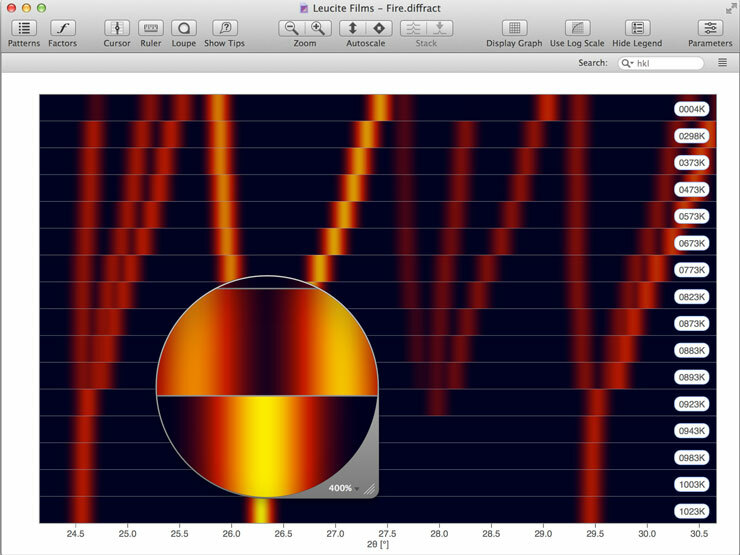 Film mode is a great way to match simulated and observed diffraction patterns. 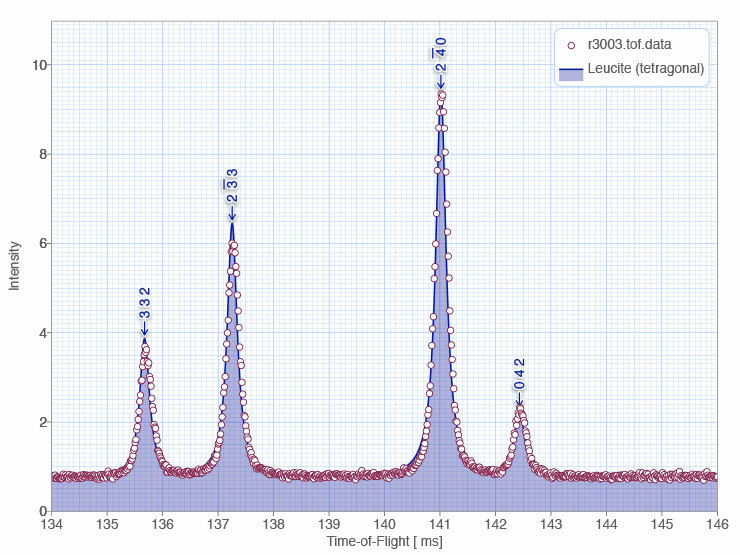 CrystalDiffract lets you simulate multi-phase mixtures simply by dragging-and-dropping patterns into a mixture group. You can adjust mixture compositions in real time, using the mixture slider and text controls in the Parameters List. Additional controls let you lock the mixture total or reset components to zero, for easy manual editing of phase proportions. 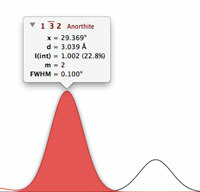 Simulated mixtures can be displayed alongside the individual patterns from their components! Just use the visibility checkboxes in the Patterns List to customize your display. CrystalDiffract 6 provides the most beautiful displays, which you can easily copy to other programs in high-resolution vector format: copy to the clipboard, drag-and-drop into other programs, or save to file. data, without the need to keep changing scale. You have extensive control over the display, including pattern colours, line and marker sizes/styles, transparency, shadows, peak overlays, gridlines, film styles and colours, peak labels (including content, positioning and alignment), Legend display, plot title - plus your text fonts and sizes. Scaling and scrolling your diffraction pattern is a breeze with CrystalDiffract's trackpad support. Just "pinch-to-zoom", and slide to scroll horizontally, or scale vertically. 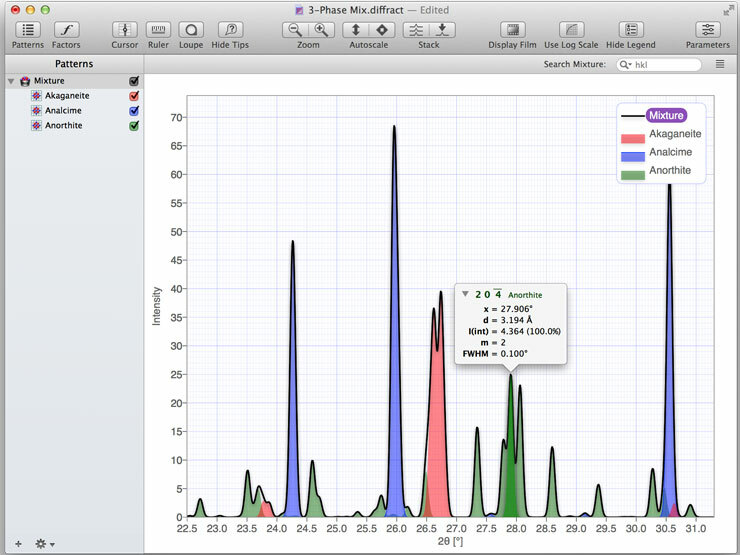 You can also specify a precise plot range, use the Scroller tool or use the toolbar's scale and scrolling commands. Patterns can be sorted according to various criteria and auto-stacked on screen. An integrated Search field lets you quickly find simulated reflexions: in the plotted pattern, or in the Reflexions List. 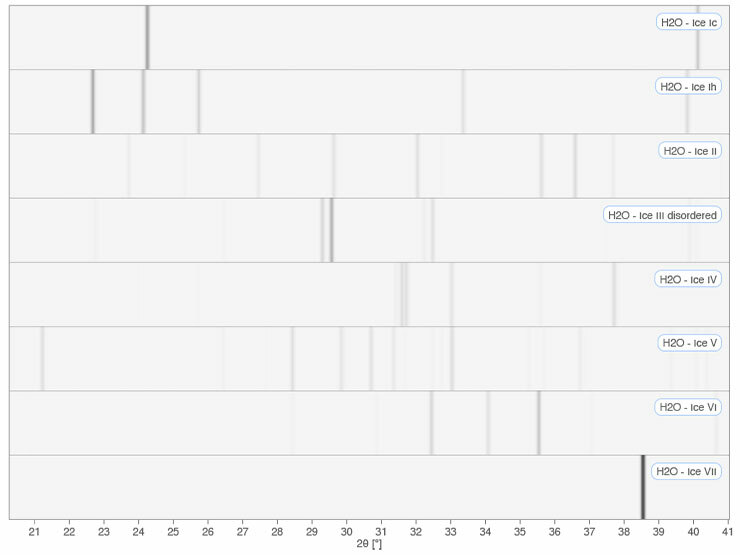 You can browse and sort reflexions in the list; double-click any reflexion to instantly locate it in the plot. move the mouse and are expandable. 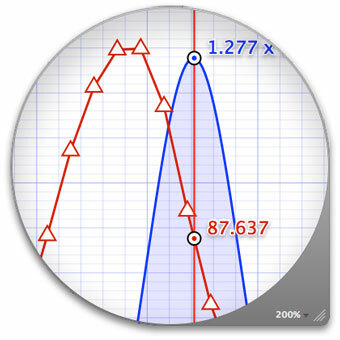 Peak Tips help you identify reflexions as you move the mouse. Tips are expandable, to show full information on each peak, including its d-spacing, relative intensity and width. CrystalDiffract lets you save your work as a self-contained document, for quick and convenient access next time you use the program. You can also export entire diffraction patterns, the reflexions list, structure factors - plus crystal structure data in CIF or CMTX formats. CrystalDiffract also has a direct visualization link with CrystalMaker: simply select any simulated pattern and choose the Visualize command; the crystal structure will then be displayed in CrystalMaker. The CrystalMaker X Office: From crystal structure to powder diffraction (top right) or single-crystal diffraction (bottom right). The Direct Visualization link lets you take any simulated pattern and visualize its crystal structure in CrystalMaker, via a single menu command. 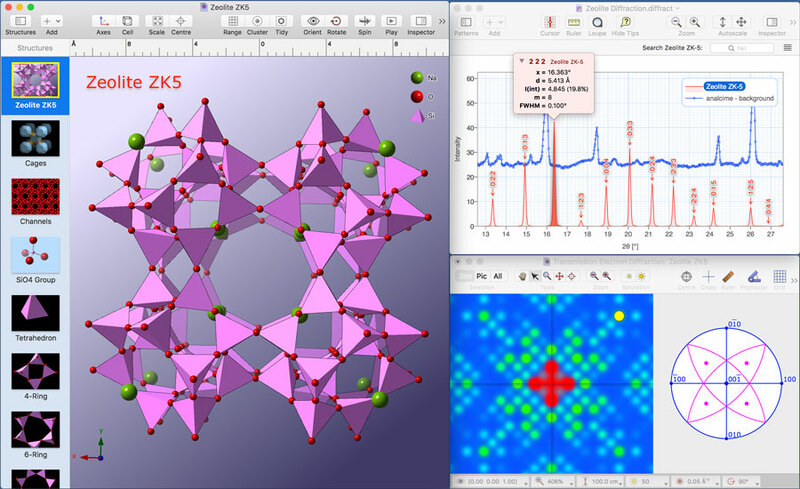 CrystalDiffract is available in two separate versions, for 64-bit/32-bit Windows (XP to Windows 10), or for 64-bit OS X (10.10 "Yosemite" to 10.13 "High Sierra"). Mac and Windows versions share the same binary file format, and similar feature sets, making cross-platform working and collaboration easy. Each version is designed, from the ground up, for its respective operating system, offering genuine operating system support and maximum performance - with no compromises. 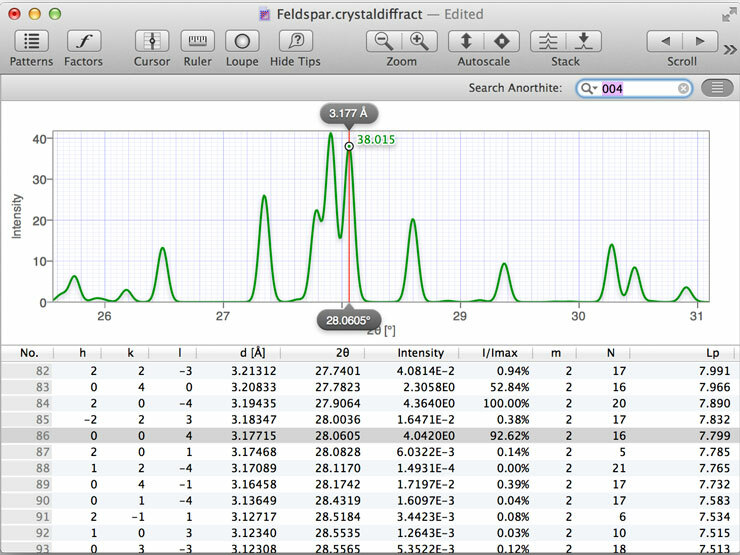 Try it out for yourself: Download CrystalDiffract for Mac or Windows today. Plus, learn how our low-cost, flexible site licensing helps empower your research and enthuse your undergraduate students.